They are all the same color, they are all precious stones, and they all come together to grant access to the Master Sword. In addition, the Pendant of Courage, for example, was lost during the time of the Great War and the 7 Sages. That means that this pendant, and, presumably, the other two, existed during the Ocarina of Time and were important during that time if they were guarded by the knights (Link's line). What do you guys think? Please be mindful of huge spoilers for those of us who have not finished all Zelda games. I'm thinking it would be unlikely. 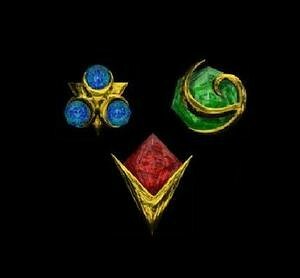 Not only do would the Stones have to be altered into their pendant shapes and be preserved for a matter of centuries or millennia (seriously, the Stones were around when Hylians ruled Hyrule, and the Pendants are around when Hylians died off centuries prior to the events of ALttP), but also the colors are technically wrong. 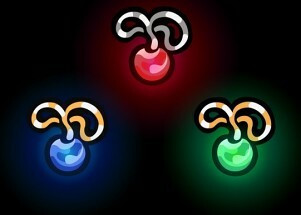 The Pendant of Courage is the same color as the Spiritual Stone of Forest, but the Pendant of Power is the blue one and the Pendant of Wisdom is the red one. Gosh of course not. They're completely different shapes! Silly Seph. Nah, there's definetly a link at least insomuch as the whole plot progression of LttP was recycled into OoT (3 stones, then Sages/Sage descendants). Whether or not they're canonically the same artefacts (in a slightly altered form), or if the Spiritual Stones simply inspired the creation of the pendants in-universe is an interesting question which I don't believe will ever be answered conclusively. I'm leaning towards the latter myself, remember LttP is set in the aftermath of the failure timeline. The sword was taken to the Lost Woods to be protected after Ganondorf obtained the Triforce. It stands to reason that they would want to ensure the worthiness of the hero who would wield it and simply recreated a similar security measure to that which was set to guard the Door of Time. But also remember the Spiritual Stones not only guarded the Master Sword, but the Sacred Realm as well. The three pendants are only concerned with the Master Sword alone. My theory is maybe that maybe all of these stones (including ones from Wind Waker and other games) are maybe forged from similar rocks or something. Magical god rocks. Doubtful, but I'd like to imagine that to protect the Master Sword, the creator(s) carved out an orb from each of the Spiritual Stones to make the pendants. The creator(s) knew they had to protect the Master Sword, but how? Realizing the only way was to utilize the power of the Spiritual Stones, the creator(s) took a fragment from each of the Spiritual Stones and fashioned them into the Pendants of Virtue. Why has no one mentioned the three fires in Skyward Sword yet? It is my belief that they are ALL the same thing. How do we know that? The Sacred Realm had already been transformed so it makes sense that LttP Master Sword could not guard the Sacred Realm, even though that was it's function. LttP and OoT had the same ToT. @Pokefreak911 - ALttP didn't have a Temple of Time. Yes it did. Where do you think you got the Master Sword from. Sure it was run down and decrepit but it was still the ToT. No, it was in the Temple of Time. The Temple of Time is in the Lost Woods. It moves. There isn't much evidence of a decayed temple in ALttP. Just an open field in the forest and the pedestal with the Master Sword in it. But it makes sense for it to be the ToT and there is no evidence to suggest it isn't. Seems to be in an odd position. We have seen what can happen to the Temple of Time if left unattended in TP, so the Lost Woods makes more sense. What? A church like building right near the castle? Perfect position to me. In TP there were ruins and stuff, there's nothing in LttP. Not really considering the castle moves EVERY SINGLE game. I have a pretty crazy theory. Nintendo just does whatever makes sense for each game and leaves it ambiguous enough for people to draw their own conclusions. No it moves. Compare the maps of TP and OoT. It may be in the center, but it moves. Also the Sanctuary doesn't even look like the ToT. Get out of this thread with your crazy theories, you lunatic. To you maybe, but the Lost Woods area with the MS looks like the Temple of Time in layout at least, it's just been really run down through all the wars.